Today Vance Von Borries might be best known for his Eastern Front games for GMT, especially his Barbarossa series, along with Roads to Leningrad and Roads to Moscow . However, much of his early career as a game designer in the seventies and early eighties was centered on the Mediterranean. Maybe his most noteworthy design from this time is Decision at Kasserine (3W), but he covered many other battles in the desert and around the Mediterranean, less well-known to the general and even gaming public. Two of those games, published in the 1980’s in the pages of The Wargamer, are Drive on Damascus and Bloody Keren . These address two lesser-known campaigns in 1941 associated with World War II in North Africa, secondary to it but still important. Bloody Keren covers the British assault on the Italian possession of Eritrea, and Drive on Damascus the Anglo-Free French attack on the Vichy French in Syria and Lebanon. Both campaigns resulted in Allied victories, but in neither case was this a pre-ordained outcome. These campaigns have not been covered extensively by historians, not as the much as Britain’s more high-profile campaigns. In fact, the best resources for further research are the bibliographies that Von Borries includes for the games, with interlibrary loan being the most effective means of acquiring the old and out of print volumes, especially those now in the public domain. Fortunately though the offensive against Vichy French Syria is covered in the second volume of Britain’s official history of the war in the Mediterranean, available online. The campaign in East Africa is covered by the first volume, again online, as well as a dedicated volume of the Indian official history. 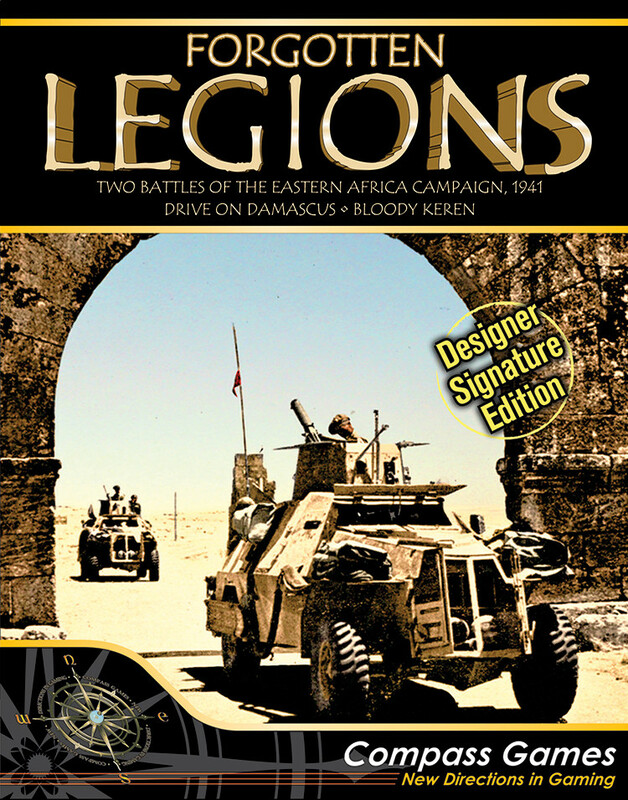 Forgotten Legions puts both games back into print in one package, with updated components. The result is a blast from the past, with two easily-accessible games employing a common system, but with a look and feel that is entirely current. 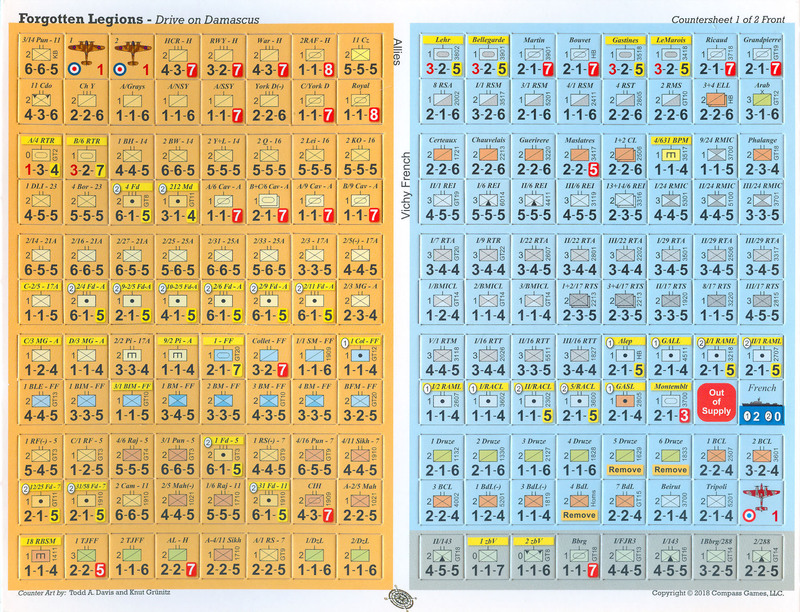 The components are now in living color, including the counters and rules. But maybe the most conspicuous change from the games’ origins as magazine games is their literal expansion. 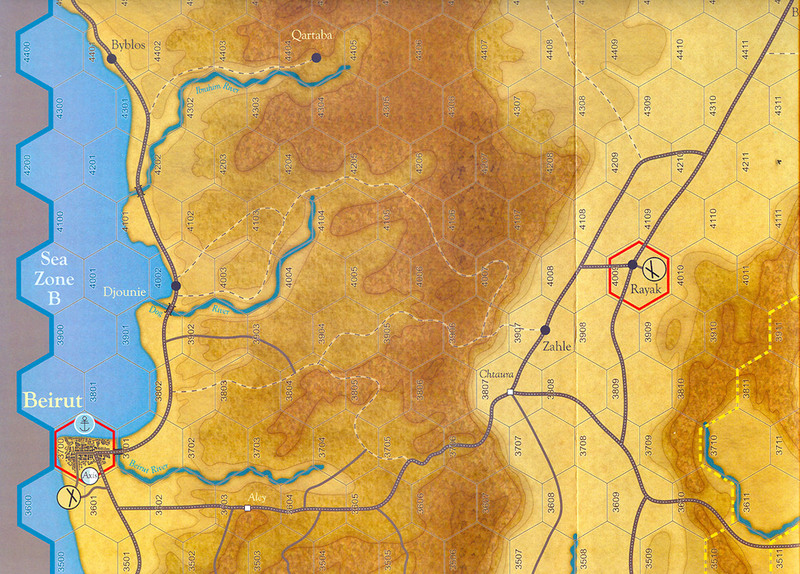 The counters are now 5/8”, with a commensurate expansion of the hexes on the maps. Drive on Damascus has two full 22” x 34” map sheets, and Bloody Keren’s play area is extended with an eleven-inch strip. The upgraded components look good, and offer functional value. Bigger counters are easier to read and handle, and they fit well into the larger hexes. The more expansive play areas too make both games seem less cramped and substantial. There are also some changes to the orders of battle, a special strength of Von Borries’ work. In Drive on Damascus, he removes the Jewish units in British service, as his more recent research indicates that they were employed in very small units and as guides. Hence, they are below the normal scale for combat units in Drive on Damascus . There is nothing revolutionary with the game system. Then too, with a Vance Von Borries design, a player hardly expects massive innovation, so much as a sound use of proven mechanisms. The sequence of play is one of moving and fighting, with combat results table that is heavily attritional. There are some elements of chrome too. One is the use of untried units to represent irregulars, such as Druze militia in Syria, and Ethiopians just south of their border with Eritrea. More importantly, the designer makes much of the ground units’ support conditional upon a die roll. Air and naval units are present in very small numbers, and while a player can call upon them, there is a chance that they will not show up. Common to many operational-scale wargames, if a player has tanks in an attack and the defender does not, there is a bonus. Yet there is also a need for a die roll, with the probability of the bonus depending on the defenders’ terrain. Success is a lot more probable on clear ground, and the chances decline as defenders occupy more broken and elevated hexes. Most support though will come from artillery. These units can offer fire support, often ranged, without a die roll. The main limitation is that one cannot exceed employ artillery greater in strength than the total attack factors of other units involved. The system overall is reminiscent of the designer’s Decision at Kasserine, and its related North Africa games, for 3W, with important differences. There are those die rolls for air and naval support, and for armor bonuses. Also, those other games have dual combat results tables, a mobile one for attacks spearheaded by armor, and one for all other assaults. The games of Forgotten Legions have just one, more attritional, table. This makes sense, as the campaigns that they simulate are infantry-centered affairs, in which armor appears in small numbers, and even then is seldom of then-state of the art quality. The notion of armored support for the infantry can be important, especially in Drive on Damascus, but the concept of armored spearheads is generally absent. While there is some room for maneuver in both, there is little-to-no room for a blitzkrieg. The unit scale for both games is mainly battalions, with some larger and smaller units. There are a fair number of Allied units that are employed in both games, despite different time and hex scales. In Drive on Damascus, hexes are three miles, and turns are one to two days. In Bloody Keren, hexes are 7.75 miles across, and turns are three to four days long. However, unit movement factors remain the same. This is not a problem though, as mobility ratings remain valid in both; the changing time and hex scales keep the units moving at similar speeds. Both take place in environments with open country, but are defined by mountains. In Drive on Damascus, the Allied advance is channeled, especially in Lebanon, by mountain ranges that run parallel to the general routes of advance. In Bloody Keren, they are barriers across the Allied attack routes, including around the game’s namesake town. In addition, the French and Italian defenders in both are far from walkover weaklings. Their quality is not bad, and the defenders of Syria have significant armor, and the possibility of reinforcement by the Germans. 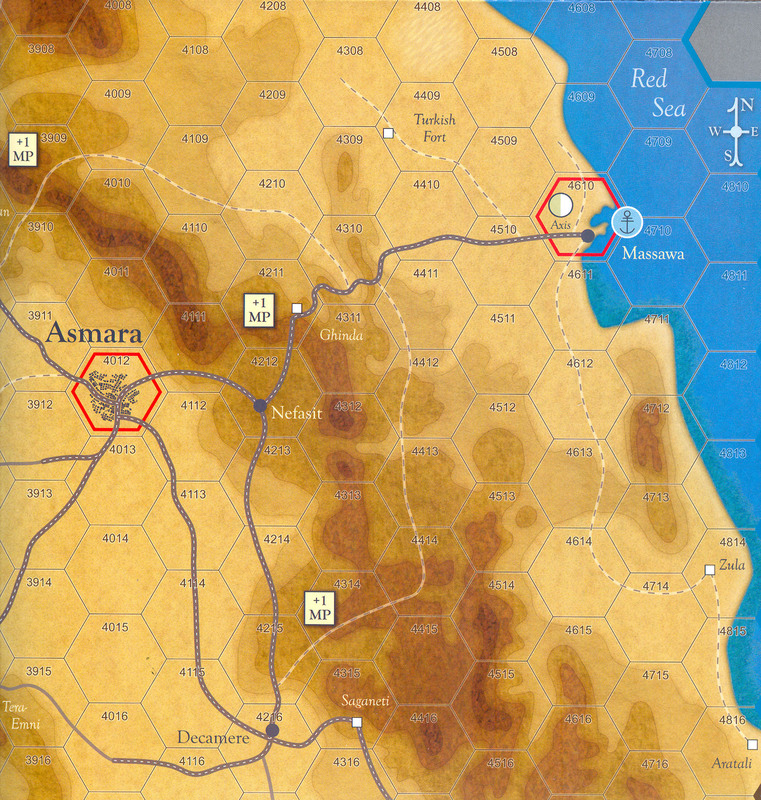 In Eritrea, Italy’s African troops need to fight in larger units, pushing against the game’s stacking limitations. They might not be extremely efficient, but they can be effective. In Forgotten Legions, one finds not one, but two older games that offer both substance and a modern, attractive look and feel, resurrected from eighties. The shared system is familiar and manageable, with the added bonus that if there are any miscues worthy of errata, they are not readily apparent. This is truly a quality effort.